Not that anyone asked, but I disagree with the above tweet. It’s not what you think though – I’m not for a second advocating teaching creationism in place of or even in parallel with evolution. Nor am I trying to placate fundamentalists. However, trying to remove religion from science is akin to trying to remove people from science – impossible and, ultimately, unscientific. Tyson emphasises the importance of scientific literacy. Scientific literacy, although problematic to define, is a vital goal for science education. It is impossible to be fully scientifically literate without an awareness of the cultural and other factors driving the research and discoveries of science. Ignoring the contextual motivators and filters of both scientists and students neglects a crucial variable in scientific experimentation. Rather than attempting to distance science from humanity in the classroom, students should be familiarised with the gloriously messy nature of science, people and all. Quantum mechanics itself can be applied here – Heisenburg’s uncertainty principle outlines the impossibility of measurement without changing the observed quantity or object. While the devil can cite scripture for his purpose, the creationist lobby can also quote scientific (or pseudo-scientific) studies. It is difficult to resist the seduction of figures and data surrounding us, not only from religious bodies but from businesses, governments and countless other sources. Statistics just seem so reassuringly solid, don’t they? But all is not as it seems. Critical thinking, a vital part of scientific literacy, is needed to wade through the initially persuasive numbers no matter their source. We ourselves, as readers, also carry our own preconceptions, religious or otherwise that may influence our integration of the scientific information into our world view. So, students need to be encouraged to consider cultural, societal and religious impetuses in order to fully evaluate concepts and make scientific decisions. 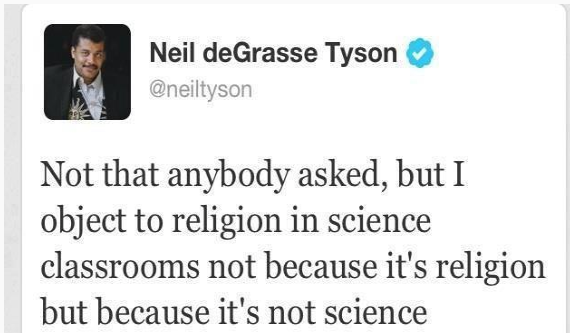 By all means, lets bring religion into the science classroom. Accept that scientists are people and not Gods, and are thus, sadly, often fallible. That’s okay, but instead of pretending that we shed all earthly thoughts when conducting experiments, students (and teachers and scientists and everyone else) need to evaluate external and internal influences. It is important to aim for value-free science, of course, but scientifically literate citizens must be conscious of the potential influences of religious and other societal contexts on the scientist and on themselves. We might not be able to fully understand or control these influences, but critical assessment of these variables can only improve scientific literacy. So, in respectful disagreement with Neil deGrasse Tyson, I am convinced that, in relevant science lessons, evaluation and discussion of religious doctrine can promote scientific literacy. I vividly remember the first scientific article I read. It was absolutely bewildering. I tried highlighting, summarising, re-phrasing – I still could not seem to understand what the authors had done, why they did it and what conclusions they came to. My peers were in the same boat, struggling through storm waves of incomprehension. We were completely unprepared for this type of text. My M.Ed research also indicated that students still struggle with scientific texts, particularly scientific articles. This is not surprising, given that scientific texts are unique in several ways. Scientific texts differ from narrative texts or even other informational texts. Firstly, scientific texts have a notoriously high level of lexical density. This simply means that there is a lot of content crammed into fewer clauses, sentences and paragraphs. Scientific texts also make use of nominalisation, which in itself increases lexical density. Nominalisation involves turning verbs into nouns, implying an impartial distance while compressing information. For example, ‘Germany invaded Poland in 1939. This was the immediate cause of the Second World War breaking out’ becomes ‘Germany’s invasion of Poland was the immediate cause of the outbreak of the Second World War’. Perhaps the most difficult of all to overcome is the demand for local inferencing. For example, ‘The wire thickness was measured using Vernier callipers, three times over the length of the wire, and the average obtained. These are accurate to within 0.001 millimetres.’ The inference required is the understanding that ‘these’ refers to the Vernier callipers. While this example is not especially complex, some scientific articles require inferencing across not just a sentence or two, but up to 30 lines. Finally, scientific texts are demanding in terms of conceptual content. It is not that other domains don’t require conceptual engagement, but some science content can seem counter-intuitive and therefore readers have misconceptions that need to be overcome. Several researchers have observed that reading instruction is almost absent from secondary schools, except for generic instruction for struggling readers. Additionally, much of the research that has been done on literacy in secondary schools has been within language classrooms. It is vital to situate reading in science within science classrooms, rather than adapting generic literacy instruction. It is this area or gap in research that my PhD aims to tackle.